Boxes! That’s what they are! Funnily enough, underneath the humour, the setting’s… Kinda bleak! 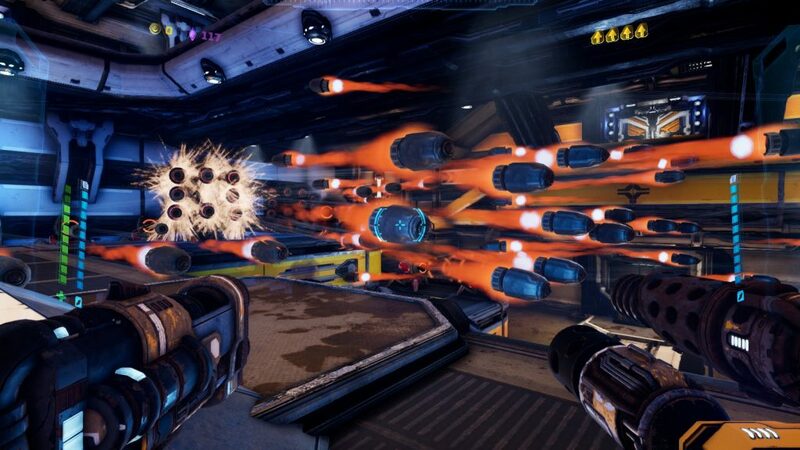 In any case, Mothergunship is a first person shooter with some procedural generation, a lot of bullets flying about, and the main selling point of being able to craft extremely silly guns from a whole bunch of parts. Of course, you have to get those parts first, by doing missions, buying them from a black marketeer, and the like, but you too, with a little hard work, can have a gun that fires slow moving rockets, mines, lightning, and lasers all at once, while reducing gravity. Somehow. With the tradeoff that the more bits you put in, the less you’re able to shoot it before having to wait for a reload. And, considering Mothergunship’s enemy spawning and projectile philosophy is “More is better” , it’s fairly safe to say you want to pack the most bang for your energy bucks. Since the normal recharge time of around 5 seconds is an eternity if you haven’t made a dent in the boodles of enemies the game throws at you. 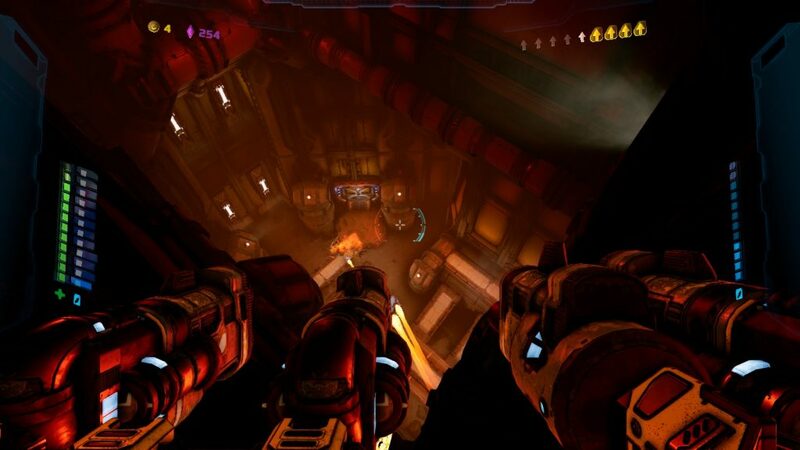 Or the dirty tricks the Mothergunship’s armada has up its robotic sleeve, like lava floors, bouncy floors, bouncy walls, bouncy robots… It’s mean. Parts of it have adaptive difficulty of a sort (The more side-missions you successfully complete, the harder they get, and if you die in a side-mission, it eases the difficulty up a bit) , but the main story missions are a fixed difficulty, and losing a mission loses you all the gun parts you took to the mission. This is a relatively mild example of a mid to late game room in motion. All-together now: AAAARGH! I’m not entirely sure how I feel about that last bit, to be honest. While you have a very generous storage space (100 total connectors, barrels, and buff inducing “caps” ), losing your best guns is a frustrating experience, regardless of the inducement to experiment with different builds. Thankfully, Side missions lag behind in difficulty, and there are a few options for gaining back those precious weapon options, and, for those of us who just don’t like to lose their guns, there’s the Joe’s Arms & Armoury missions. 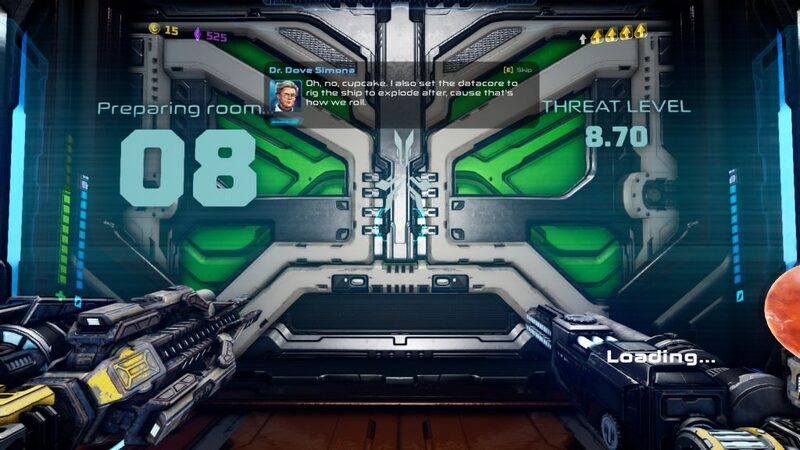 Joe’s Arms & Armoury: Gun shaped solutions to mothergunship shaped problems. Which is as good a segue as any into how crafting guns feels. Beyond my one minor irritation with the system (Switching between removal mode and attachment mode feels needlessly finicky), playing with that energy/part tradeoff feels good, and I’ve found myself affectionately naming some ideas. The Friendly Fire, for example, asks the question: What happens when you add a 20-40% chance of spawning lava mines to individual shots… When you have three chainguns? It doesn’t fire for long, but the damage over time helps while away the recharging! Similarly, The Finger, consisting of some railguns, damage multipliers, and bounce mods, generally means that anything obliging enough to stand in a rough line from where I’m standing… Definitely gets The Finger. While this is a low intensity shot, I’d like to point out… This jump was 90% done with rockets. Not even your traditional rocket jump either. Just… Shootin’ those rockets downward. So, apart from the fact the game is, if not twitchy, then hectic, which unfortunately shuts out some folks from the game, there’s a lot good about Mothergunship, but one last thing definitely deserves a mention: The farcical humour. Farce must be played with a straight face, and of the cast, only the long suffering AI Jasper consistently plays the put-upon straight man, with the overall result of a humour heavy, fully voiced dialogue through the story’s missions. The Colonel is a cheery, blowhard incompetent. Dr. Dove Simona, although arriving late to the story, enters it with bombast, arrogance, and… Look, I don’t think it’s the Colonel that wants a cigar (he has a lollipop, because who loves you, baby), it’s Dr. Simona. Wilkinson’s VO really sells the long-suffering woman techie, and even the side characters, such as Hylas, get their moment in the sun. Pretty good, for something where most of the dialogue involves characters we never see more than a portrait of. As such, overall? 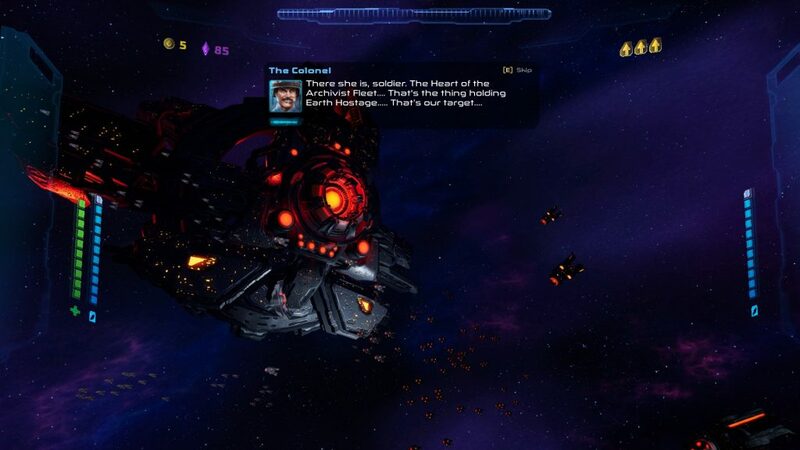 Beyond its speed and difficulty, which, as mentioned, shut out some folks, there’s not a lot that goes against recommending Mothergunship. It’s funny, it’s silly, it’s bombastic, has only minor niggles with its core design pillars, and looks nice to boot. Enjoyable! Dr. Dove Simona: Making damn sure you know she’s a top. 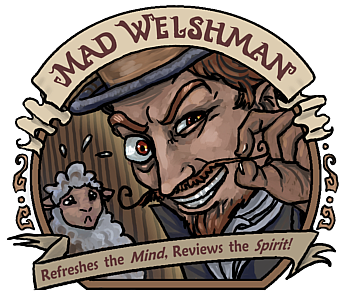 The Mad Welshman would like to state that he is not, in fact, secretly an Archivist Ship spreading Archivist Propaganda. Please step into the Not-Archiving Machine.